I've run calculations to investigate annual energy savings using the StackHR concept in place of traditional natural ventilation for Danish climate. The model assumed a Ø160 mm PVC pipe wrapped in 30 mm of glass fiber insulation as the outer tube, and a thin walled aluminium pipe as the inner tube. At no point did the heat recovery efficiency drop below 52%. On average it was found to be approximately 60% with an average flow rate of just over 2.5 L/s. 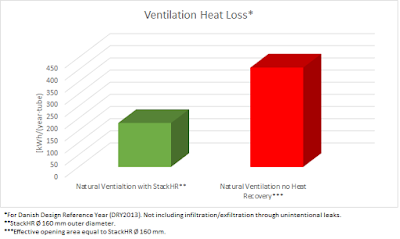 With a standard deviation of 1.2, the flow rate is relatively stable attesting to the benefits of selecting stack effect as the driving force for the ventilation. Up to 4 of these tubes per slab segment (1200 mm wide) can be integrated, achieving an occupant density of 1 occupant per 8 m^2 floor area. For each of the StackHR tubes used, 228 kWh of heat per year is recovered and thereby saved in energy costs. I have added a new page describing the calculations and methodology as well as additional information about why one should choose StackHR. You can view the page by clicking the "WHY" link above.